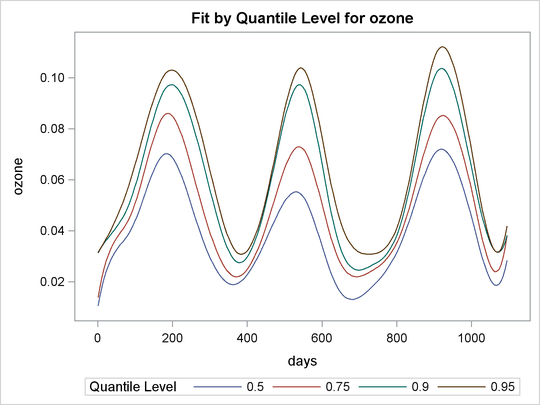 Output 83.4.1, which displays the time series plot of ozone concentration for the three years, shows a clear seasonal pattern. Output 83.4.2 displays these curves. 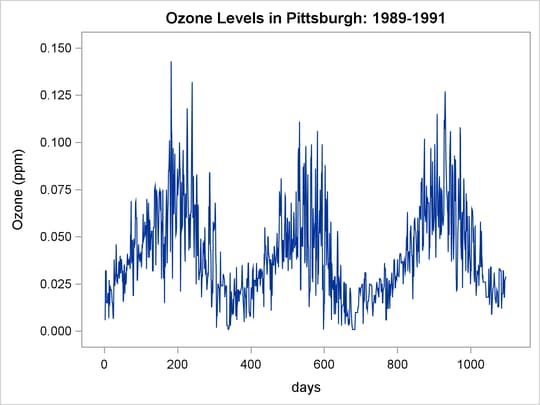 The curves show that peak ozone levels occur in the summer. For the three years 1989–1991, the median curve (labeled 50%) does not cross the 0.08 ppm line, which is the 1997 EPA eight-hour standard. The median curve and the 75% curve show a drop for the ozone concentration levels in 1990. However, for the 90% and 95% curves, peak ozone levels tend to increase. This indicates that there might have been more days with low ozone concentration in 1990, but the top 10% and 5% tend to have higher ozone concentration levels.